"The earliest account of the electrical experiments made by Benjamin Franklin, at Philadelphia, (where he was then the post-master) appeared anonymously in the GENTLEMAN'S MAGAZINE for January 1750." 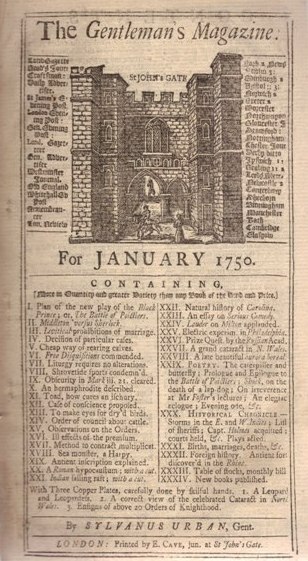 This is a complete January 1750 issue of the famous Gentleman's Magazine and it contains an article often missed by collectors of Benjamin Franklin and early science. It contains an article entitled "By a Number of Experiments, lately made in Philadelphia, several of the Principle Properties of the Electrical Fire were demonstrated, and its effect shewn." The fact that this article was by Franklin and about his electricity work is documented by the April 1857 Gentleman's Magazine, in an article entitled "Autobiography of Sylvanus Urban" at p. 357 where it states, "The earliest account of the electrical experiments made by Benjamin Franklin, at Philadelphia, (where he was then the post-master) appeared anonymously in the GENTLEMAN'S MAGAZINE for January 1750." The Franklin electricity article in our 1750 magazine mentions two of Franklin's important discoveries 1) the positive and negative aspects of electricity that "attract" and "repel" and 2) that electricity is "more strongly attracted by slender sharp point than by solid blunt bodies." The latter finding was a prelude to his famous lightning rod discovery, which was first recorded in the May 1750 issue of Gentleman's Magazine. 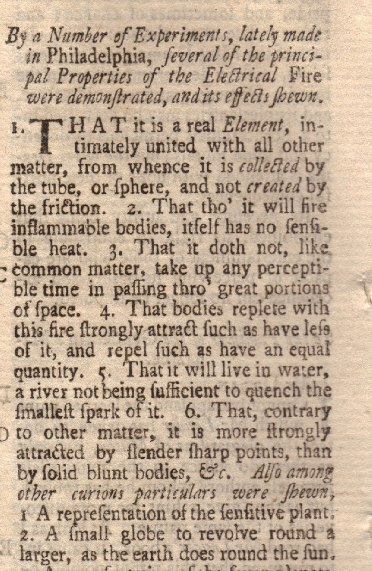 The article does not mention Franklin, just as the more famous lighting rod experiment letter in the May 1750 issue does not mention him, but it is clear by mentioning Philadelphia and the two characteristics of electricity noted above that were first discovered and/or written about by Franklin that the article is speaking of Franklin's experiments and in his words. The "Sylvanus Urban" referred to in the 1857 article was the pseudonym for Edward Cave, the publisher and editor of Gentleman's Magazine and the person who published, at the request of Peter Collinson, Fellow of the Royal Society, Ben Franklin's first work on electricity in the following year, entitled "“EXPERIMENTS AND OBSERVATIONS ON ELECTRICITY, MADE AT PHILADELPHIA IN AMERICA, BY MR. BENJAMIN FRANKLIN, AND COMMUNICATED IN SEVERAL LETTERS TO MR. P. COLLINSON, ESQ; OF LONDON, F.R.S.”, was published the following year and it included the letter included in this issue. To get a copy of that book will cost you over $60,000. 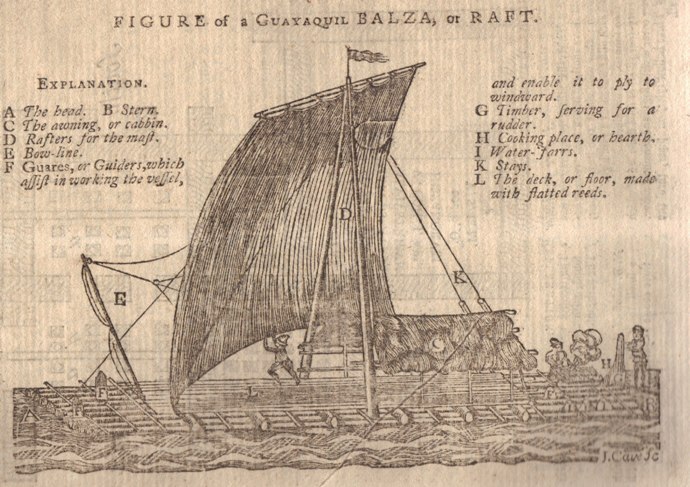 The January 1750 issue of Gentleman's Magazine also includes an interesting article and engraving of a South American sailing raft somewhat like the one's the Thor Heyerdahl used in his Kon-Tiki expedition to show the likely immigration path of South Americans to the Pacific Islands. 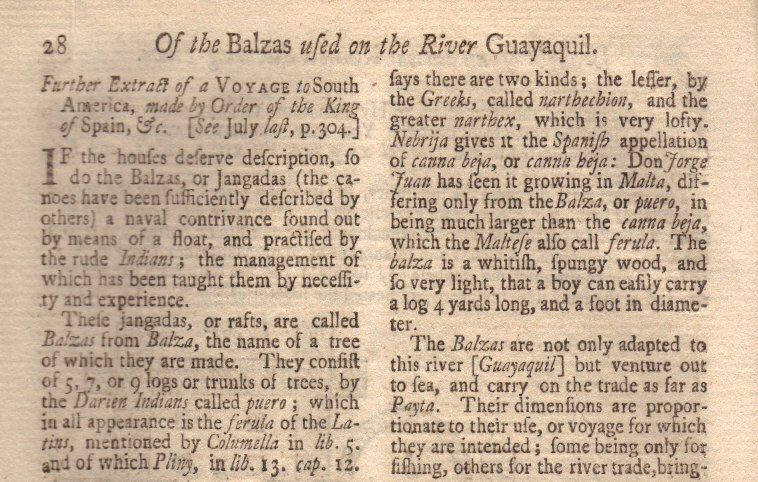 Here it is called a Guayaquil Balza or Raft. The magazine has a wealth of interesting articles, including one of insects in the American colony of Carolina (before there was North and South Carolina). The title page for the issue is shown below. A wonderful newspaper with a great article on the history of the discovery of electricity with a clear reference to the work of Ben Franklin.